I will admit that I am not the world's biggest fan of mixed martial arts or to be perfectly honest, I do not really like the sport at all. It is not the idea of two sweaty men punching each other in the face that puts me off (after all, I do enjoy some good old fashioned pugilism). Perhaps, it is the rabid fan base or maybe it was that horrible film by David Mamet that has made me ambivalent to the modern sport of kings and fraternity boys. Regardless, ever the fan of one, Thomas Hardy, I was on board with seeing Warrior...Sadly, it took longer than expected to check it out and one would be surprised how well I liked this film (Now, if I could only recoup the time lost watching Redbelt). 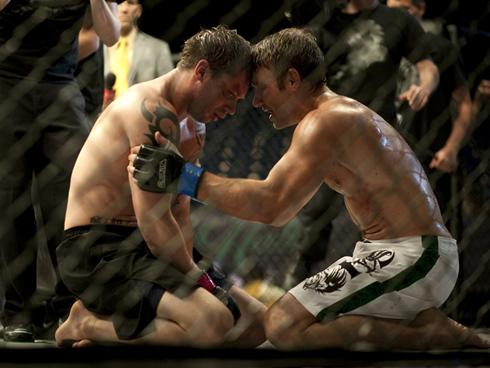 The fight sequences in Warrior are merely the window dressing to the emotional core of the film. It is a story that examines the fractured family dynamic that is all too common in the United States. The patriarch is a formerly abusive alcoholic, whose choices destroyed the Conlon family and through his new found faith, hopes to repair his relationship with his sons. The younger of the two,Tommy (Tom Hardy) is a man troubled by his past and ultimately seeks to fulfill a promise to a fallen comrade by entering the Sparta tournament. His older brother, Brendan enters the same tournament to keep from losing his home after he re-financed it to pay his daughters heart transplant. In the most dramatic circumstance imaginable, the final round of Sparta pits brother against brother. For most, Warrior will inevitably draw comparisons to The Fighter and in many ways this is fair. 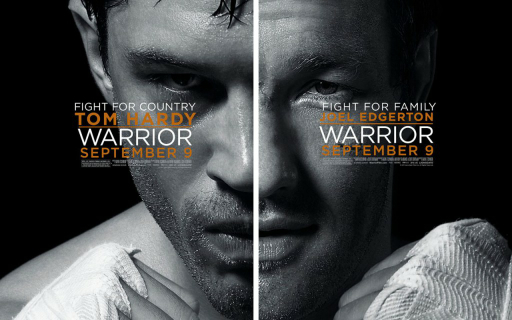 Yet, I will be bold to say that Warrior has a better story, while The Fighter had the better performances. While both involve two men pummeling each other, the prize in Warrior is not one of the Conlon boys winning five million dollars but their reconciliation. This in my opinion is more satisfying than a man obtaining the Welterweight title. I thoroughly enjoyed, it is just an old man dwelling on the differences between apples and oranges. Regardless of its classification of being The Fighter-lite, Warrior is a film to be taken on its own merits. I did not have any pre-conceived notions outside of Hawk enjoying the film (which is always a good sign) and several people getting their faces knocked in. The film truly breaks out of the sports film genre. As I mentioned earlier, I was more interested in the relationship between Paddy Conlon with his sons than the fight sequences. I must confess that I did find those to be exciting as well. All in all, this is a film that would enter my surprising category for films in the year that was 2011. Namely, I knew it was a film that I wanted to see but never figured I would enjoy it this much. Who would have thought that Nick Nolte plays a convincing drunk (that joke is several years too late). Seriously though, his breakdown was worth an Oscar nod alone. Completely off-topic but the Film Foray Cavalcade turns FIFTY with this post... Looking pretty good for someone hitting middle age. Also, the new and improved Rooney Rating system returns next post.